Baseball, America's national pastime, has been a part of our history and our heritage for over 150 years. From spring to winter, whether it's a big-league game or just the children in the neighborhood, someone somewhere is playing baseball. When playing baseball, you'll need a baseball mitt, but it's not always as simple as that. If you're left-handed, then you already know that finding a mitt can be a real headache. There are also different mitts for the different field positions. Infield mitts are smaller than those of the outfielders, and the catcher's mitt is heavily padded to stop the concussion from a killer fast ball. Baseballs, uniforms, bats, cleats, batting gloves, and bat weights (also referred to as "doughnuts") are all items that you are likely to need for serious baseball games. Some players also use shin guards to defend against grounders. And catchers, of course, have their own array of gear, from knee guards to face masks to chest pads. This sporting goods store chain offers a broad selection of baseballs, bats, gloves, footwear, and baseball accessories. Major League Baseball collectibles and memorabilia. 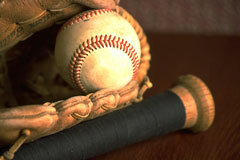 Manufacturer of baseball and softball pitching machines, batting cages, and accessories. A supplier of equipment that is used for baseball, softball, and athletic fields.